Since 1978, Audio Pro have built loudspeakers with one ambition: to give you the best sound at the best price. 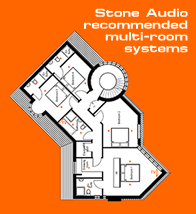 Audio Pro want as many people as possible to be able to enjoy good sound quality at home. Many speaker manufacturers design their speakers to deliver the ideal frequency curves when tested in echo-free (anechoic) testing chambers. Who lives in an echo-free testing chamber? No one we know.The acoustics in a padded test chamber and those in your living room have nothing in common. If you've never been in an anechoic chamber, then you should know that the acoustics there resemble those of a small closet filled with winter overcoats. In an ordinary room at home, on the other hand, all sorts of sounds are reflected as they bounce off walls, floors, ceilings, furniture, etc. If you put a conventional speaker in a room at home and measure the frequency response, it will be anything but straight. Liberating wireless sound for your music and pure hifi audio for your TV. With four inputs including one wireless, the Addon T20 is the hub of all your home audio. Stream your music wirelessly, connect your TV, Apple TV and turntable simultaneously. With the Addon T20 we have made ​​sure that your listening experience never will be limited, whether it be music or film. And your flat screen TV will deliver a full-bodied sound! Your perfect hifi companion for wireless sound. For music, TV and movies and great for hom studio use! With four inputs including one wireless, the Addon T14 is the hub of all your home audio. Stream your music wirelessly, connect your TV, Apple TV and turntable simultaneously. With the Addon T14 we have made ​​sure that your listening experience never will be limited, whether it be music or film. And your flat screen TV will deliver a full-bodied sound! Addon T8L is no ordinary speaker, this is true hifi shrunk down to fit next to your computer, TV, or on a bookshelf. Modern and stylish, well-built and heavy, these small loudspeakers takes your music to a whole new level with great fidelity sound and wireless music via Bluetooth® 4.0. Play from any device that has Bluetooth, which IOS® devices, Android® and of course Mac or PC. Addon T3 is the perfect speaker to take with you when you need good music. Out in the garden, on the balcony, on a picnic or out of the park. T3 plays amazingly well with clear treble and deep bass, simple operation, elegant portability and sound characteristics that will surprise even the most discerning hifi enthusiasts. Available in 5 amazing colours. The rechargeable battery gives 30 hours at half vol and 12 hours at max. T3 wireless speakers use the latest Bluetooth ® 4.0 standard for best sound quality and transmission. You can play your music wirelessly from any Bluetooth devices; iOS ®, Android ®, Windows Phone ® and Mac / PC. A total of 25W and advanced DSP,. Addon T3 delivers a purely amazing sound from such a small speaker. The Link 1 unit is clever little multiroom player. A simple way to connect any audio gear to the Audio Pro multiroom system. Connect to any powered speakers, radios, hifi-systems or AV receivers. It’s easy.We know everybody says this, but this truly is. From lightning fast setup to using, it’s all smooth sailing.Free app for iOS and Android. Music should be felt, not just heard. Their engineers have optimized the acoustic design to render stunning dynamics, deep bass and acoustic pressure in abundance. The T5 follows the extremely succesful design of the Addon single box speaker. Keeping it as simple as possible, while never forgetting about audio performance. And this little speakers delivers sound which might surprise many. What you see is what you get. And hear. Bluetooth® 4.0 lets you stream your music effortless and in premium sound quality from any device which has Bluetooth. Whether you use iOS®, Android®, Windows Phone® or Mac/PC, you can enjoy your musik in a simple and fun way. The USB port on the rear charges most smartphones.